OK, the last few miles of last Saturday’s long run were a bit of a struggle. But the run was also a bit strenuous, so I tried not to read too much into it. The following morning I was up early enjoying the Winter green along the Garapito Trail. That run went well enough, but the weekend left me wondering if my revised training plan was going to work. The plan for today was to do around 26 miles, but the question was what kind of 26 miles and where? 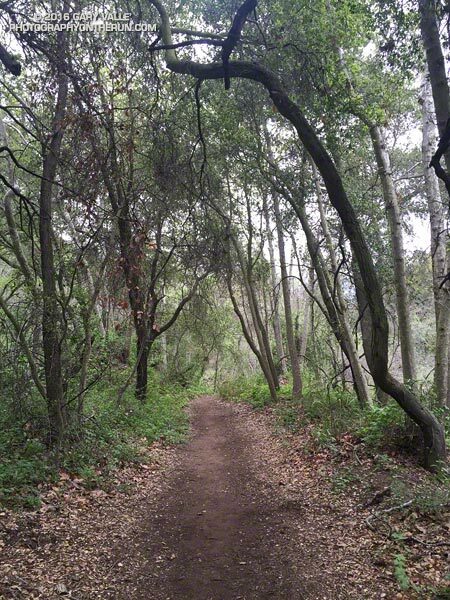 After debating several options I finally settled on a run from Marvin Braude Mulholland Gateway Park at “the end of Reseda.” The route would merge the Will Rogers – Temescal Canyon loop with the Trailer Canyon – Santa Ynez Canyon – Trippet Ranch loop. The term “loop” is used loosely here, just meaning that the run starts and ends in the same place, but isn’t an out & back. I’d done the loop a couple of years ago and my recollection was that it was around 26 miles with an elevation gain of something over 5000′. 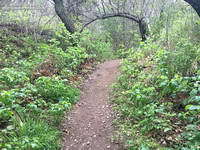 It’s a good run to do self-supported since water is usually available at Will Rogers, Temescal Canyon and Trippet Ranch. It can be brutal on a hot day, but that’s true of most lower altitude runs in Southern California. Hot temps were not going to be my problem today. Mostly cloudy skies were forecast with very light rain in the morning. The heavier rain was supposed to hold off until around midnight. It had already rained a little when I left for the trailhead, but conditions were supposed to improve during the middle of the day. Running up to the Hub I had no clue how the run was going to go. I usually don’t until 2-3 hours into a long run. At around two hours I was at Will Rogers and feeling pretty good. 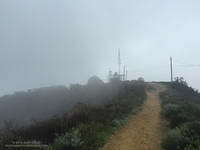 At three hours I was nearing the “waterfall” in Temescal Canyon and at four making the turn left down Trailer Canyon. Usually the decision to turn down Trailer Canyon is a painful one. You’ve done all that work to get up to Green Peak on Temescal Ridge and now you’re going to run down Trailer Canyon and give it all away? Today, for some reason, losing all that elevation and then having to gain it back again wasn’t a big deal — it was just another part of the course. I still had over a mile to the Trippet Rnach parking lot and from there my usual route back to Reseda on the Musch, Garapito and Bent Arrow Trails would be around 7 miles. I briefly debated shortening the route. The thing is, despite last week’s issues, I felt good and the run was going well. The conditions were perfect, so why not run the route as planned? As things turned out today’s run was 5 miles longer than last Saturday’s and had about the same elevation gain. Somehow that translated into a 30 minute faster run than last week and legs that weren’t stiff or crampy. What changed from last week to this week? If only I could figure that out!